Air mattresses are fun, they are convenient, and they serve a purpose. Every household should have one stashed away just in case you get an unannounced visitor. Any kid can tell you how awesome it is to watch a flat bundle of plastic almost instantly inflate into a comfortable, fun, and movable bed. They’re right to thrillingly explain how fun an air mattress can be. We review the best air mattresses in the market today in this article. 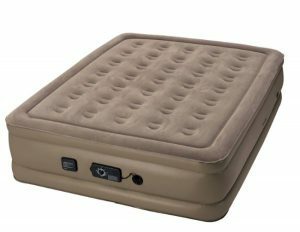 If you do not have time to read this in-depth review of top air mattresses, go buy SoundAsleep Dream Series Air Mattress. It is an all-around winner and our top pick. This is the one most closely resembles a normal bed. As its name implies, it is tall and raised pretty high off of the ground. These beds often contain multiple air chambers which create a remarkably durable bed. After you inflate these types of air mattresses, they tend to hold firmly and produce a comfortable sleeping surface. These are generally two twin beds, which could be either split up or put together to make one large bed. The flexibility these air mattresses offer are amazing for guests. Buying a convertible air mattress is in most cases less expensive than purchasing a pair of twin beds. Air mattresses can now be purchased with accompanying frames. These frames are usually metal and they are lightweight and portable. The frames allow the mattress to be off the ground like a traditional bed. This is ideal for homes with solid floors that tend to get cold like tile floors or concrete floors. The cold does not transfer to the mattress making for a more comfortable night’s sleep. Additionally, they also come equipped with rails made of foam that typically attach right to the mattress. You should look for air mattresses that have a sturdy and thick foam rail. The rail provides a better sleeping experience because it prevents the sleeper from falling or slipping out of the bed while sleeping. The best air mattress with a frame, we think, is Coleman QueenCot Airbed. Air Mattresses with inner pumping systems are definitely the only solution if you intend on using airbed every single day. Even though manual pumps can get the job done and they are reasonably quiet, is is beter to buy an airbed with built-in pum to save your time. In the event that you love outdoor camping and have to blow up several beds, then think about using one regular electrical pump to cut down expense. Having said that, if you’re planning on having an easily transportable mattress, then give some thought to buying a mattress with an integrated pump. Some air bed mattresses are sold with remote controls which enables you to modify the total amount of air and height of the mattress. This really is a good choice for picking out the ideal amount of air, without needing to getting out of bed and work with a pump part way through night time. An air mattress can be made with a variety of materials. 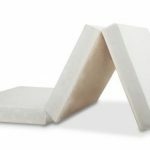 The most popular is the standard latex comforting memory foam. Memory foam in an inflatable mattress is similar to the kind of memory foam you find in a regular bed. It is designed to adjust and conform to the unique ridges and contours of your own body for the most comfortable sleep possible. Memory foam inflatable mattresses are more expensive, but it is also one of the most comfortable air bed options you can buy. You and your guests need the best sleep you can get, so the cost might be well worth it. Air bed makers have made great strides in improving upon the standard low raised air mattresses of the past. 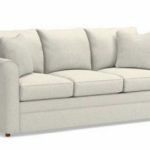 Air mattress might save you some money in the near term if you’re in between mattress but, whenever possible you should always consider investing in the mattress with the features that best match your lifestyle and needs. They typically come in all of the same standard sizes of regular mattresses: Twin, Twin XL, Full, Queen, and King. King air mattresses are difficult to find, but manufacturers do make them. We reviewed what we consider to be the best 5 air mattresses for you based on quality and value. These air mattresses are very popular among consumers. This is the highest rated air mattress on the market. Consumers rate this mattress so highly because it is comfortable, durable and very easy to use. This air mattress was thoughtfully designed with 40 coils to create a flat sleeping surface. 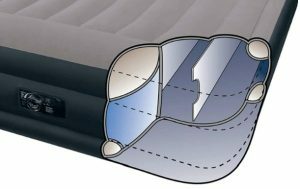 This air bed provides excellent edge support and inner support for a comfort level that is hard to duplicate in the world of air beds. The top of the mattress is both soft and waterproof. It’s been described by consumers like sleeping on a traditional pillow top mattress. 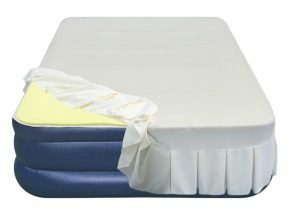 This mattress is quick to inflate and deflate with the internal pump that is included with the mattress. The mattress stays in place on the floor with its sure grip bottom design; a functional feature for in home use. This particular version is designed to be used in your home rather than outside, but the makers of SoundAsleep also designed a camping version which also includes a pump that operates on a rechargeable battery. This air bed has a capacity of 500 lbs. It comes equipped with multiple layers of puncture proof material, and the SoundAsleep holds the average couples’ weight comfortably. This mattress is best suited for people who need an air bed for an everyday use that is durable and reliable. This is definitely the value for your hard earned dollars. The Insta-bed name is a very popular brand that takes pride in crafting beds that are more comfortable than their competitors. The special technology they created ensures their products are comfortable enough to keep customers asleep all night long. Many reviewers call this bed their favorite because of the brand’s consistently high-quality products. 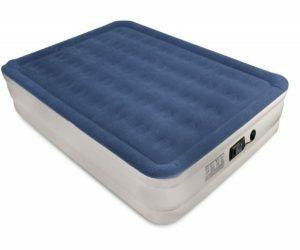 The Insta-Bed Raised Air Mattress with Never-Flat Pump is no exception to this brand’s exceptional reputation for high-quality products. With a height roughly equal to that of a regular bed, its inflated queen size dimensions are 80″ x 60″ x 19″. If you need an air bed that provides comfort, convenience, and durability you’ll seriously want to consider purchasing this air bed. The Insta Raised Bed is great for camping, but make sure you have enough space in your tent for the queen size air bed. Don’t sleep on the ground in a sleeping bag when you can just as easily pack this comfy airbed instead. Most customers who purchase and review this air bed absolutely love it. You’ll find plenty of air mattresses that are notorious for deflating prematurely. With this bed’s dependable never-flat pump, you’ll never have a bed that slowly flattens as you sleep. If you or a family member suffer from back pain or joint issues, The Insta Raised bed is a great choice because this bed actually conforms to the individual shape of the body. 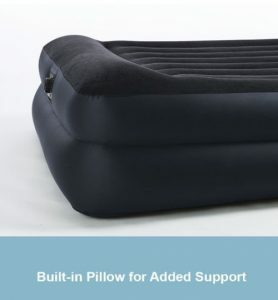 It provides adequate cushioning and supports to prevent the joint and muscle pain that can occur when sleeping on lower quality air beds and traditional mattresses. This bed is best suited for people who need this for everyday use, and for people who can afford to spend a little extra money for added comfort. This mattress needs to remain plugged in to receive constant power to stay inflated through the night. This bed is another fan favorite. Many customers are repeat customers and most rate this mattress highly. 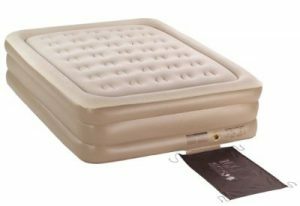 If you need a good and sturdy air mattress, then you should definitely consider the Intex Pillow Rest Twin Airbed with Built-in Electric Pump. 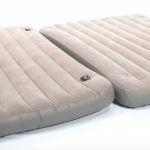 This is one of the best twin air mattresses on the market, and it is often used for camping trips, overnight guests, and even in hotel rooms. This is also a good option to store for spare bedrooms. If you choose to keep this inflated, then you will to need give it some air as necessary, because the vinyl material has a tendency to leak air over time. This is normal and should not be cause for alarm. This mattress comes with a built-in electric pump for simple and easy inflating. You’ll never have to search for a lost pump or worry about separately purchasing one because this one is built into the mattress. This air bed offers additional features that make it a favorite over some of its competitors. This bed is durable, firm, and quite comfortable. Many consumers report they slept just as well on this air bed while on vacation as they did on their own bed at home. One unique feature of this bed is the 15 gauge vinyl beams on the sides and bottom to provide extra support and stability. The waterproof flocked top is convenient to clean in case of accidental spills. This is a fabulous air mattress option in the mid-range price point. This is best suited for children and people with small frames. Those looking for a mid-price air mattress will find this to be a great purchase. The Intex brand offers a deluxe model air mattress that comes with a 21.2-gauge waterproof flocked top and 15-gauge vinyl beams on the sides and bottom. This air mattress offers you a cozy sleeping space. This bed comes with a built-in, power pump to quickly inflate without any fuss. The button control helps you regulate the pressure so you can set it to the most comfortable level for your needs. At 19 inches high this mattress is much higher than standard air mattresses. This mattress has a minimum of 3 years of moderate use before it sprouts a leak or two on the lower portions. This air bed meets most of the common criteria one considers while researching air mattresses. It is an affordable option that comes with its own electric pump and is easy to inflate. It offers an acceptable height from the floor making it easy to get in and out of for people of all ages. This mattress is easy to deflate and store when it is not in use. It isn’t bulky so it will store inconspicuously in a closet in your home. This is a great option to have for unplanned or unannounced overnight guests to sleep on. This option is best suited for people Intex brand loyalists who might be looking for a deluxe model air mattress. Coleman is a highly reputable brand name popular among camping enthusiasts. They make a variety of camping related products from stoves to lanterns to tents and more. Coleman is an extremely popular brand that is a favorite of many people because of their many high quality and functional products. 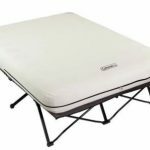 If you’re looking for an air bed to take on a camping trip or if you need something to sleep on for an overnight trip to a friend’s house, this amazing bed is no exception to Coleman’s expected high quality. So many air beds make you feel like you’re sleeping on the floor, but this bed is doubled in height so you can easily get on and off of it. This air mattress has a soft and cushy top, and many consumers consider this air bed to be of an equivalent quality to an actual bed, especially when considering its comfort. The Coleman Double-High Quickbed is easily transported because it has a convenient wrap and roll system. The convenient wrap and roll system makes it easy for you to be packed and ready very quickly with this extremely helpful feature. Customers report being especially happy with this high-quality construction. This bed is made with a heavy duty puncture resistant PVC, a comfort coil system for added support, and a soft, cushioned top for superior comfort. The price is also very attractive to consumers. It will be hard to find a better deal for a high-quality air mattress. This air bed is best suited for people who are in the market for an air mattress that is better than average when it comes to comfort. This bed is easy to get on and off of and it does not require a built-in pump. 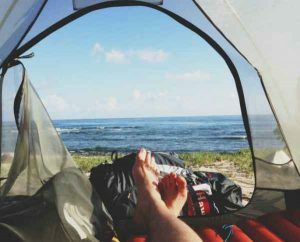 Framed air mattresses are becoming increasingly popular among campers who want to elevate themselves off the ground. Metal frames are light, portable, and easy to set up. However, if you like the great outdoors experience of sleeping on the ground, you can skip the frame and stay closer to the ground with your traditional air bed. You can find plenty of cheap air beds without a pump, but just know you will be using your mouth and your lung power to inflate it. However, you can also purchase external pumps powered by electric outlets or car outlets. They also make Truck-Bedz air mattresses that are made specifically for people who want to sleep in the back of their pickup trucks, SUV’s, or mini-vans. These mattresses come in different shapes and sizes and are specifically made to fit a number of vehicle types. Perhaps the best camping air mattress are the self-inflating kind for people who pack light and for people who love to rough it. These are heavy duty air mattresses and are made to endure the craggy and uneven surfaces of the earth. They are slim and light and these mattresses are certain to provide for a rich and full camping experience. Click here for comparisons and more detailed information on camping air mattresses. Try not to over-inflate the air mattress. It can be tempting to make your mattress as firm as possible, but too much air can lead to rips and leaks. When you first use your mattress, fill it to 90 percent capacity, and then wait three hours and deflate it. Repeat this process once more. Then fill it up to capacity. This trick works by getting the plastic use to expanding and contracting before you actually place your body on the mattress. Once the fibers of the plastic experience a little bit of ware, it will respond better and be in its ideal and intended shape for first time usage. You’ll have to constantly check for leaks. This includes listening for hissing noises and always checking the valve to ensure it is closed properly. You can use a soap and water solution to spray the mattress down and look for bubbles. If a leak is found, it can be easily fixed with patches or adhesives. Do not ever overload the mattress. The mattresses are not made to support multiple sleeping bodies. Check the box, labels, instructions and packaging for capacity and weight limits. Keep away from dogs, cats, and other animals with sharp nails. Even if they don’t bite, one misaligned paw step can leave a long scratch, a tear, or a hole. Remember the air mattress is to sleep on, not for play. Don’t wrestle or jump on the mattress. It is definitely tempting, but you’re not going to get the same longevity out of your air mattress is you play on it. Avoid using sharp objects near the mattress. Pens, pencils, and knives, all can pinprick the mattress and leave you with hard to find holes and leaks. The good news for your air mattress is that in the event of a leak, a repair is doable with the right tools and materials. Air mattress repair kits sometimes come with the mattress, but if not, they are commonly purchased from camping stores or big box retailers. The leak repair will vary depending on the kit, the size of the leak, and supplies on hand. The steps below tell you how to do a quick and dirty patch job on an air mattress. To repair a leak you have to know where the leak is. After you find the source of the leak, deflate the air mattress. Apply a sealant after the mattress completely deflates. Wait five minutes after applying the sealant to let it dry. Repeat step four twice for a second and third coating. You are now essentially done. You can add a repair patch on now sealant applied to the leak area, but the sealant may be all that is needed. If your air mattress keeps getting leaks or has too many patches it may be time to upgrade to a new one. Check out our top 5 air mattress reviews. Purchasing an air mattress should never be a spontaneous endeavor. You should first consider your needs and invest some serious thought and research before you invest your dollars. There are a variety of makes, models, brands, and sizes. The only way to determine what is best for you is to do your research and to make some comparisons. An air mattress can be a wonderful tool for a person who is constantly traveling or for a household that gets some unannounced guests from time to time. Equally, an air mattress can also be a nightmare if you purchase a type that doesn’t fit the needs you had in mind.